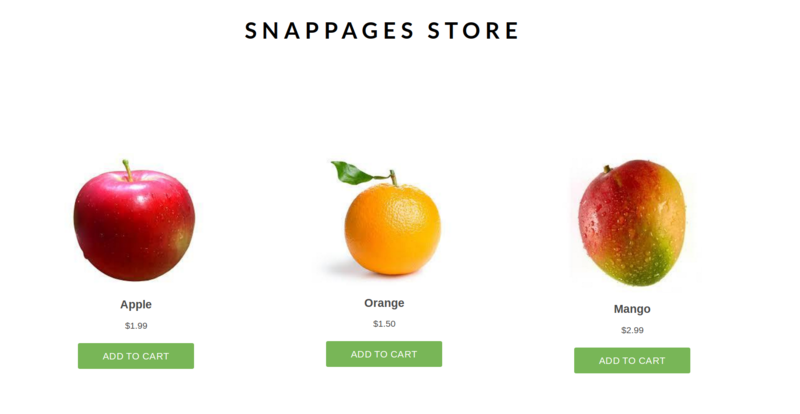 Again, Shopify is not the only e-commerce service you can use with your SnapPages site. However, we do recommend it as an option to consider as it's a great service, and they offer SnapPages customers the ability to sign up at a reduced pricing rate. Additionally, they offer a risk free 14 day trial so that you can test out the service prior to paying to upgrade. To get started with Shopify, click HERE to sign up for a Shopify account at their special sign up page for SnapPages customers. From there, follow the steps to set up your online store. Once you've completed the initial sign up steps, you'll be taken into your Shopify account where you can begin building your store. While they offer some getting started tips/tricks once you log in, you can also find their comprehensive help center HERE. Once you finish adding your products or services and have set up your store through Shopify, it's time to add the store to your SnapPages site. To do this, click Buy Button from under the Sales Channels tab in your Shopify account's dashboard. From there, click Select Products, manually choose the product you want to create the 'Buy' button for, and then click Select Product. From there, you will be taken to a screen in which you can adjust the look of the button and customize it to your liking. Once you've finished customizing the button, click Generate Code in the upper right hand corner of the page (button displayed in the screenshot above). From there, click Copy embed code to clipboard. Once you've done this, log into your SnapPages account. If you haven't already done so, you'll need to create a page for your Shopify store. To do this, access the 'Pages' section within your account, click New Page and follow the steps to set up the page. Once you're in the page editor, click Add a block from the left hand side of the page, select the Code block, and drag it to where you want it on the page. From there, title the set of code (only you will see this - customers won't see this) and paste the code you previously copied and click 'Save'. When you're done editing the new page in the SnapPages page editor, be sure to click Publish to apply the changes to the live version of your site. To add more products to your site, just repeat this process for each of the products in your Shopify store that you want to add. Additionally, Shopify has an option to lump all the products you want displayed in your store into a Collection that you can use if you want to display a lot of products all at once. That's it! If you want to dig deeper and customize your Shopify store further, you can definitely do so in Shopify. Again, if you need help or have any questions about how Shopify works, just visit their Help Center. Do you want to use a different e-commerce service than Shopify? No problem! While the steps will not be the exact same for every e-commerce service out there, they will be pretty similar. If you have questions about how to integrate a specific service into your SnapPages site, please let us know - we will be more than happy to help!